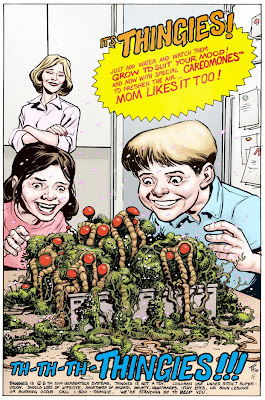 when declan suggested man-thing for our theme a few weeks back it really lit a fire in my belly (ha!). if my previous go at the character could be considered the basis of a weirdo southern-gothic pitch, then this one can be considered my balls-out gerberian societal-horror story. nathan's amazing colours (thanks nathan) are the icing on the cake! but wait... is that the pitter-patter of tiny, otherworldly feets i hear? simply, john carter with cute furry animals, stocked on a bookstore shelf next to bone. I am so pleased to see so much Rocket appreciation. One of Marvel's greatest characters, in my opinion. I want, no HAVE, to know more about this turtle. That's a beautiful painting, Tom. I especially like how you created depth with those robots. WOW! That Rocket Raccoon piece is amazing! 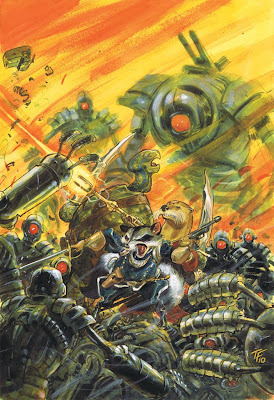 I need there to be a painted Tom Fowler book starring anthropomorphic critters on the shelves RIGHT NOW. Christ! You are an amazing man! Your new legal name is Tom Wowlers. Yes it has to be plural...cause i say wow every time i see your art work,sir. I don't know. A friend of mine ordered Thingies™ and the ThingCubator™ habitat. When it arrived, turned out to be peat moss in a box with these gross red mushrooms that made his skin peel. I am not much of a Rocket Raccoon fan, but I seriously WANT the book you have described here! That really needs to happen!